Pruning is probably one of the most confusing topics for new gardeners because there is no single method or timing that suits all situations. But, there are some basic underlying principles that, once you know them, can make it much easier to know whether to snip and clip or leave things alone. 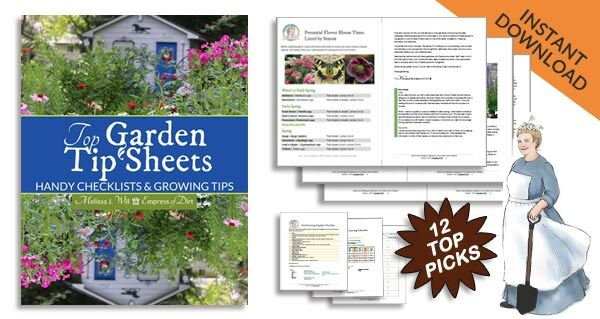 I’ll walk you through some easy Pruning 101 guidelines as well as my own pruning and deadheading calendar which you can adapt for the plants in your garden. This is part of a series with tips for pruning everything including trees, shrubs, vines, and tomatoes. Plant health and safety | Removal of dead, damaged, or diseased, or overlapping branches, buds, or roots, as well as suckers and water sprouts assists with plant health (strength, air circulation, sun reach, and pest and disease resistance) and appearance. Control size and shape | Pruning can improve the plant structure in addition to allowing better air and light conditions. Stimulate new growth | Pruning encourages new growth. Always prune for a specific reason, not because you think you should do it. When I started gardening, I had the impression that pruning was simply a necessary annual chore. It was only when I read up on it that I realized that while some pruning (and deadheading) can serve specific beneficial purposes, it may not often be necessary, and, without intention, could be detrimental. The one type of pruning that has no set timetable is the removal of dead, damaged, and diseased branches. These are either lifeless or may cause further damage to the plant if they are left in place, so get rid of them any time using anvil pruner, loppers, or a tree saw for removal. 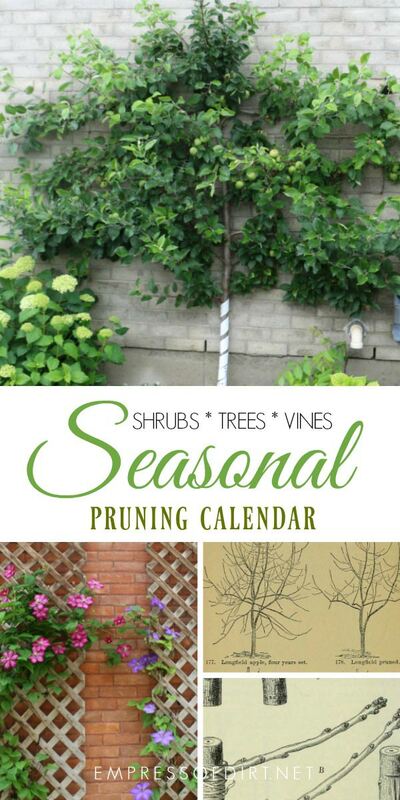 All other pruning has best times of year, and this depends on the species and its budding cycle. In general, the principle is, prune when the plant is asleep (dormant) and does not have buds. The best time for pruning most trees, shrubs, and vines (if they do need pruning) is late winter and early spring unless they are early spring bloomers and already have buds. The second-best time is summer. After flowering is the best time for spring bloomers. Avoid fall. Pruning stimulates new growth and you don’t want this with winter on its way. Dead, damaged, and diseased branches can be removed any time. Deciduous trees, evergreens, and non-coniferous shrubs handle pruning best in mid-winter when the sap is not running. Avoid the heavy sap flow time in spring for trees like walnut and maple (and other trees you can tap for syrup). The key for pruning flowering and fruiting trees and shrubs is to know when the plant fruits and whether it produces the fruit on old or new wood/growth. The goal when pruning is to remove the old (and no longer useful or flowering wood) while protecting whatever parts are creating new flower and fruit buds. Many flowering perennials are best cut back (removing old, dead growth) in spring just as the new growth starts poking up. While you could do this in the fall, you would be removing valuable winter food and habitat for wildlife (from microbes to birds and more), so wait if you can. Trimming herbaceous growth like leaves on a boxwood hedge is done during the growing season (ending weeks before first frost). Bypass pruners are the best tool for pruning smaller, living branches on trees, shrubs, and vines. These provide a nice, clean cut without damaging any plant tissue. Be sure to clean your tools before use and between plants. I use rubbing alcohol and then heat the blade briefly with a lighter. Unless the plant material is dead, damaged, or diseased—in which case you remove all of it—the general rule is to never remove more than one third of the entire branch or plant. I save dead branches in a branch crib, allowing them to decay and return to the earth. The birds love this. Research before you cut! Where you cut depends on what you are trying to accomplish. This could be removal of crossing branches (remove them at the base) or encouraging lateral growth (remove the terminal buds). The possibilities are too numerous to list here. Look up your specific plant and follow instructions you trust. And, the more you look over your plants, the better you will get at recognizing what should be trimmed and why. As a general rule, the best buds to keep are those facing outward, so new growth will also grow outward instead of inward, congesting air flow and light. If you are removing heavier branches, work in sections, taking outer pieces first. This will make the job safer and avoid tearing the plant when the final cut is made. Remove dead, diseased or damaged limbs, suckers, overlapping or leggy branches. Deciduous, evergreen, and fruit trees. Shrubs grown for foliage (barberry, burning bush, euonymus…). Bush berries (blueberry, gooseberry, currants-oldest stems only). This is my main garden clean up time for the year. Summer-flowering perennials (daisies, coneflowers, black-eyed Susan’s…) – cut down last year’s growth. DO NOT PRUNE shrubs that bloom on old wood (previous year’s growth) or you won’t get any flowers. Wait until they flower and then prune if necessary before new buds form. Ornamental grasses – remove old, dead growth. Roses – remove dead, damaged, or diseased branches only. Careful not to remove any new buds. Flowering perennials and annuals – deadhead (remove finished blooms) to encourage a second round of flowers. Trim and shape greenery like boxwood hedges up until 6 weeks before average first frost. Once-a-year blooming climbing and old garden roses – deadhead after blooming is finished. Clematis – look up which type you have and use this pruning guide. Remove dead, damaged and diseased branches only. Hold off on deadheading perennials: wildlife including birds depend on perennial seed pods and old growth for winter food and habitat. TIP: Put ribbons on any branches you need to prune when trees and shrubs are dormant in the winter. Cane Berries (raspberries and blackberries) – remove two-year-old canes soon after they finish bearing. Remove dead and decaying parts with minimal impact on the next buds, bloom, or fruit. Be sure to google pruning instructions for your specific plants to learn the best tools to use and exactly how and where to cut. Want to know which pruners work best? Here’s the guide you need. Hi Melissa, I have a few questions for you. We just moved in our home about this time last summer. Haven’t really done anything with the existing flower beds besides trying to keep the weeds out. There are already established shrubs and perennials around the house. We’ve decided it’s time to make the beds look a little more appealing to our neighbors. Ha! We researched and planted a few things in big pots with a mixture of perennials and a few annuals for color. They look beautiful. BUT…..there are a few shrubs I don’t have clue what they are. They are in the flower bed that runs along the length of my garage which happens to be to front lawn. There’s three of them with I guess boxwoods (remember..beginner here) on either side then crepe myrtles at the end of each bed. But these three shrubs slap in the middle had overgrown so high they weren’t a long ways off from my roof. And they have a willowy look to them. But I got complaints from our HOA that our house number was completely hidden so I took my hedge trimmers to them ? The underneath branches seems black to me. To stand back and look at them it almost appears they had been on fire at one time (which isn’t the case) but if I breach a branch off its more just dark brown. Strangest thing really. Idk if these things are dead or what. I have no clue what they are! I downloaded the app you recommended to identify flowers. Should I snap a picture of these and see if they can tell me anything? I need advice on what to do with them. I don’t suppose you offer anything like that? I could send you a picture and u give me advice on what you would do with them. They are really an eye sore. I also have a few perennials in my backyard that look very sad. A rose bush in terrible condition. I’ve never even attempted roses before because they intimidate me. There are a few blooms. Is just very thin and sad looking. Do you offer advice from pictures like I’m describing or can you recommend a site that does, or do I have to break down and call a professional out here for help. Once I know what I should do, I can go from there. Your tips on here plus Google and utube, I can get it done. It’s just the recommendations to start. Any suggestions? Thanks! Oh and forgot to mention that I’m in northern Louisiana. Hi Emily, You could take photos and video on your phone and show someone at a good local garden nursery to ask for advice. Melissa, bless you! My question is about the winter composting. May one use a Black Trash can, rather than steel? I’m in so cal, so our winters aren’t as extreme as what I recall in Canada. Thanks for sharing your knowledge! Hi Marla, There’s two things I consider: can the container hold up in the weather (yours sounds like a yes) and is it safe? Could the container leach unwanted chemicals or substances into the compost? This may take some research to answer. If both are fine, I would use it. Very kind of you, Wen. Thank you. And sunny days for you too! I am looking to start a garden this next spring at my new house. I really like what this article says about decay being beneficial. I think that the decaying plants would only help the soil. Thanks for sharing, this has been very helpful.